Keep up to 3,000 commonly requested documents on the MP C307's standard 320 GB document server (hard drive), so you can print at a moment's notice. 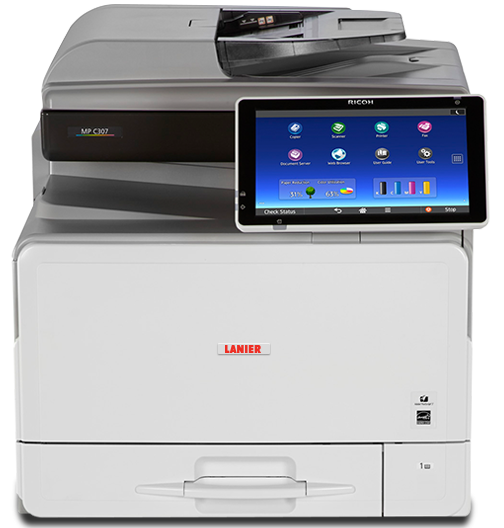 Separate print, copy or fax output for faster, easier document retrieval. And get more work done rather than stopping to reload paper by increasing the standard 100-sheet capacity to 200 sheets with an optional 100-Sheet One Bin Tray. For reliable high-resolution scanning up to 80 images per minute (ipm), PageKeeper models include a multi-feed detection sensor, which stops a scanning job if more than one sheet is fed through the single-pass document feeder.